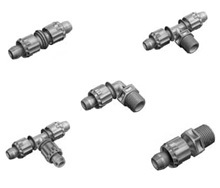 OMEGA’s tube fittings solve many small tubing problems. Made of polypropylene, they provide chemical compatibility. Sized for 1/16", 3/32" and 1/8" plastic tubing. Chemical Resistant Material Polypropylene fittings provide excellent chemical resistance. This strong material is much lighter than brass, attractive in appearance and reasonably priced. Other materials or colors are available on request. OMEGA’s Panel Mount Hose Barb Union connects tubing through panels up to 1/4" thick. Delrin acetal is strong and chemical resistant. Applications include vacuum, pressure lines, fluids and gases. Tapered 10-32 Threads OMEGA’s threaded fittings feature a tapered 10-32 thread that needs no gasket to form a reliable seal. Fittings will seal even in slightly off-sized holes. The tapered thread also allows the fitting to be directionally oriented without a gasket. Shrouded 1/16" Hose Barb Eliminates Breakage The patented shrouded design eliminates the most common problem of small fittings -- barb breakage. The shroud completely supports the tubing, reducing stress on the fragile hose barb. It solves the problem of breakage without expensive metal tube fittings.